The wearing of uniform helps to give the school a corporate image besides being a practical, hardwearing solution to school wear. It also shows respect for the school and helps show the community at large the high standards we try to maintain at Clover Hill. Bottle green pinafore or skirt and bottle green tights. 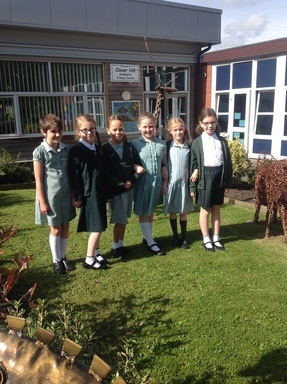 If girls would like to change their uniform in the summer months they can wear bottle green and white check dresses or dark grey/black tailored medium length school shorts. Boys can wear dark grey/black tailored medium length school shorts. There is also a fleece, a waterproof coat and a cap that also carry the school logo. Uniform can be obtained through the school office by completing an order form. Orders are usually in school within a week. Some chain stores/supermarkets sell the bottle green items. Your child will also need a Book Bag to keep books flat in transport from home to school and a PE bag for PE kit. These are available from the school office. We are pleased to announce that you can now order your child’s uniform direct from our long serving supplier Tots to Teams using his wonderful website from Monday 24th July. You can also visit his showroom in Kingston Park and try on uniform. As a Clover Hill parent/carer, if your order value is over £45.00 you can request your order to be delivered free of charge to your home address otherwise there is a delivery charge of £3.80 for orders less than £45.00. Any order placed via his website will also give you the option to collect your uniform free of charge from Tots to Teams or delivered free of charge to Clover Hill Primary School. Please visit www.totstoteams.co.uk and follow the process to create your account.